Columbia River Knife & Tool has always produced a very diverse line of sharp things. 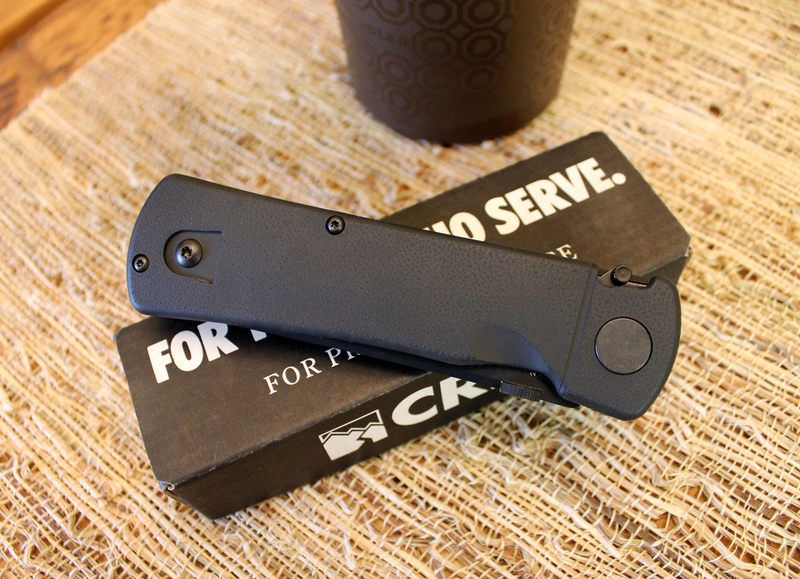 In collaboration with stellar knife designers such as Frank Centofante, Brian Tighe, Ken Onion, Flavio Ikoma, Kit Carson, Ron Lake, Pat Crawford, and still more, CRKT has brought us a galaxy of practical and artistic products. Hissatsu, which translates to “sure kill” in Japanese, are knives constructed around martial combat. Williams’ samurai sword background explains the tanto-style penetrating blades. Given that a folding knife does not possess the structural integrity of a fixed blade, Williams sought to bolster the Hissatsu folder’s mechanics. I will say that the Hissatsu folder is overbuilt in a good way. 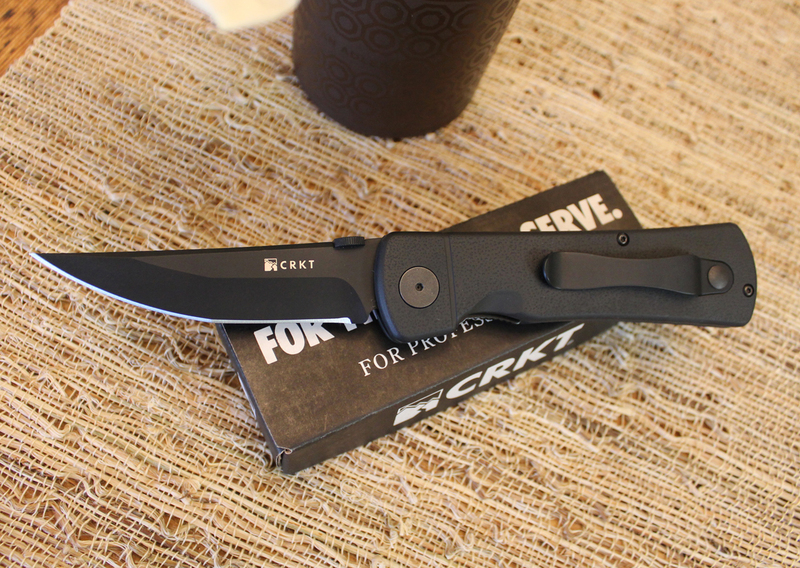 A stout pivot point, heavy steel liners, and a thick blade provide a feeling of security and competence with this knife. At 5.8 oz, it is not so much a tank, but a light armored vehicle. Williams gave the Hissatsu folder a 3.875″ blade of AUS 8 stainless steel, Rockwell Hardened to 58-59. The blade length was intended to be just short of the 4″ maximum allowed for carry in many jurisdictions. The blade is pointy, yet sturdy. 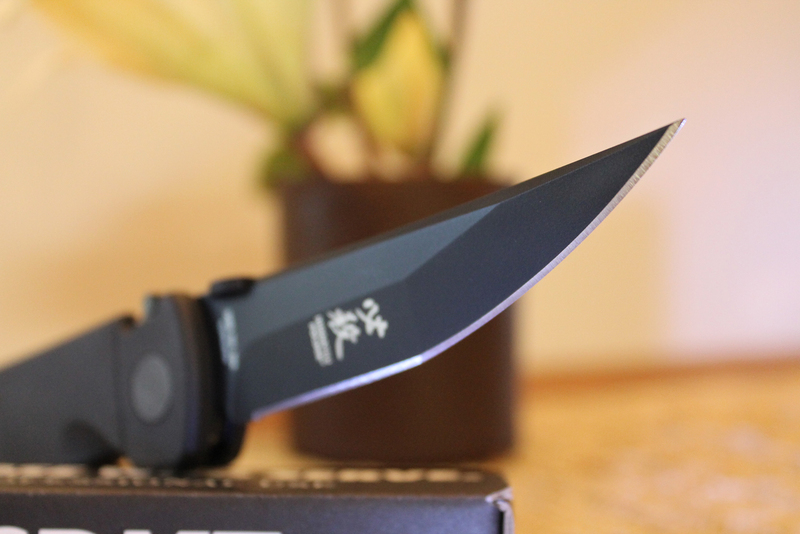 Hissatsu’s blade is deployed with CRKT’s Outburst assisted-opening mechanism. Using the ambidextrous thumb disk, when the blade is pushed out to 30 degrees, the Outburst spring takes over and fires the blade the rest of the way. A liner lock holds the blade immobile. The Outburst mechanism can be disabled by undoing a single set screw, if the owner wishes. 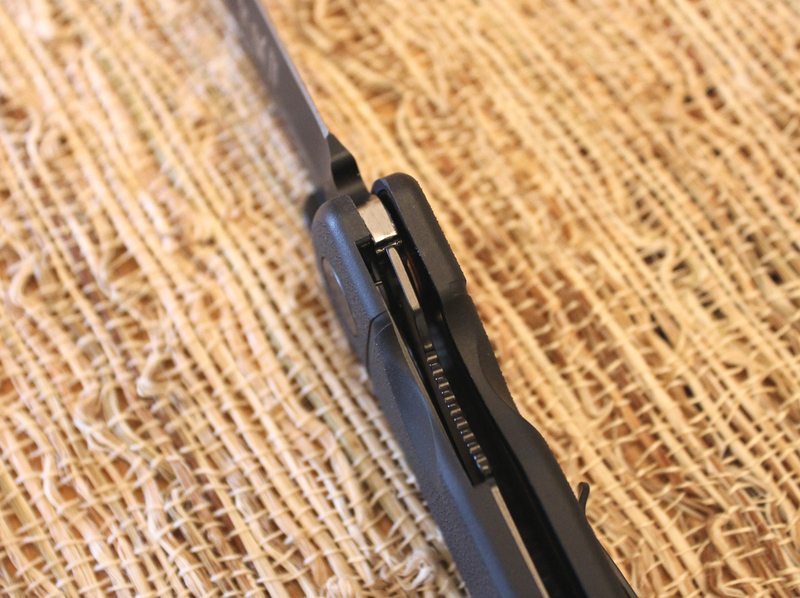 CRKT’s AutoLAWKS safety engages when the blade is open. 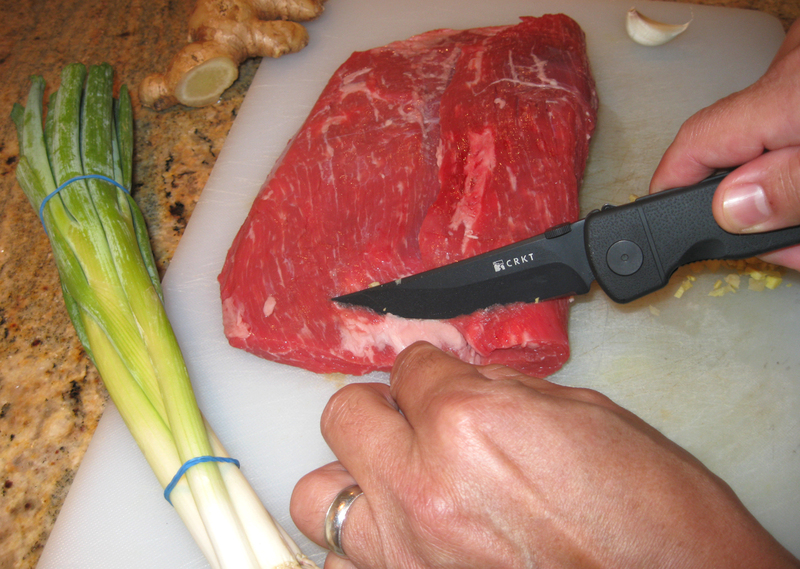 The liner lock cannot be disengaged until the AutoLAWKS lever, on the top right of the knife, is pulled back. Williams says this makes the folder a virtual fixed blade, since the liner will not be able to slip from the blade’s rear face under duress. Two stainless steel liners and fiberglass-reinforced nylon scales make up the large handle of the Hissatsu. The scales have a pebble texture and a hard rubbery tactile feel. The pommel is rounded off, for a thumb shelf in a reverse grip. Williams intentionally left off a window breaker or “skull crusher” for this reason. With the heft and imposing size of the Hissatsu’s handle, it can easily be used in the closed position as a fist load or Kubaton. I am not fond of the pocket clip on the Hissatsu. It is mounted so that the knife rides high in the pocket. Though the clip is solidly anchored on a massive rear tube through the frame, I wish it were a “fold-over” design to get the knife more snugly hidden. Because of the large size of the handle, the Hissatsu could be carried in a spare magazine pouch on the duty belt. I would not forsake ammo for that, however. For a road test, since I thankfully did not have any close combat requiring a knife on my last few shifts, I gave my Hissatsu the mundane utility tasks for which it was not really designed. Cardboard and some wood chopping were understandably ho-hum: blade stayed sharp, no chipping. I was making some Korean-style grilled flank steak for dinner, so I put the Hissatsu to work in the kitchen (hey, Asian warriors of old ate, too). Again, the knife performed superlatively. I may have said this before, but I do not use my duty knife for general utility purposes if I can help it. A knife that potentially would be used for self-defense should be razor sharp at all times. If in a pinch I use the knife to pry a door lock or cut something at a scene, which I have done, I immediately get it back to a hair-splitting edge ASAP. CRKT also makes a gentleman’s folder version of the Hissatsu called either the Hissatsu 2 or Heiho. It is a scaled-down version of the original and has nice smooth-sided G-10 furniture and a satin blade. The pocket clip of the Hissatsu 2 is made for deep pocket carry. An online purchase of a Hissatsu 2 set me back just $36.00. The MSRP for the full-sized Hissatsu folder is $99.00. I bought one online for $56.00, and no, not on Cyber Monday. In my opinion, the Hissatsu is a highly capable, detail-driven martial folder that will not unduly lighten your coin purse. 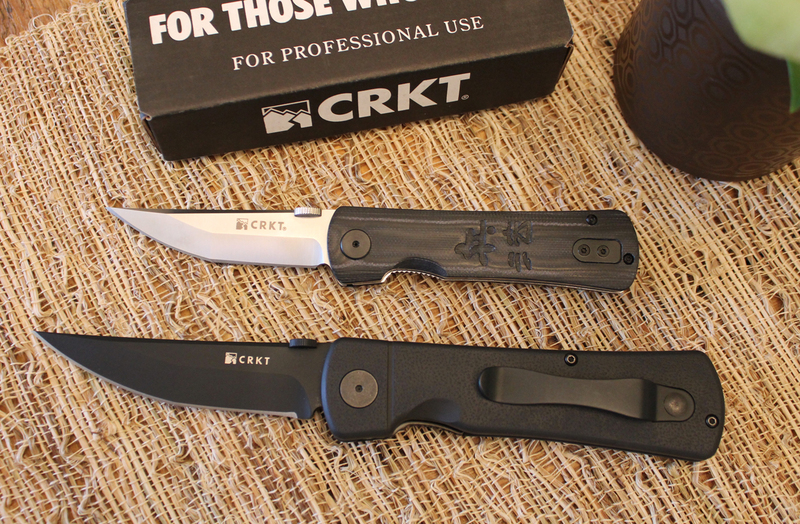 This entry was posted in Knives and tagged Columbia River Knife & Tool, CRKT, Hissatsu Folding Knife, Police Folding Knife. Bookmark the permalink. 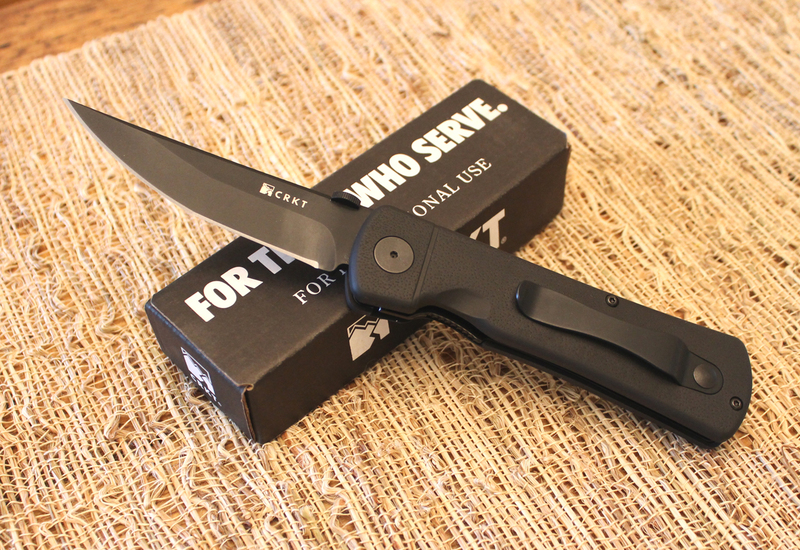 Good review, but you should mention that many people can not reliably open this knife. There is a trick to the opening and I really doubt if anyone could get it right under stress. Mine was added to my collection and put away. I would not carry it because of the opening difficulty. I had trouble with the “Outburst”, so I took it out. I lift weights and still had this problem. CRKT has instructions in the box on how to do this. I think this is the best folder they have. It is scary sharp, locks up soundly, and is a joy to hold in the reverse grip. People look very solemnly at you when you show them this knife in an open position. It is all business. Love it! Joseph, I agree it is certainly an imposing knife when open due to its size and rakish blade style. Congratulations on your purchase!